Wordless Wednesday: ok, it’s fall…. Colchicum ‘lilac wonder’ coming up through a groundcover of leadwort (Ceratostigma Plumbaginoides) with yucca ‘color guard in the background. 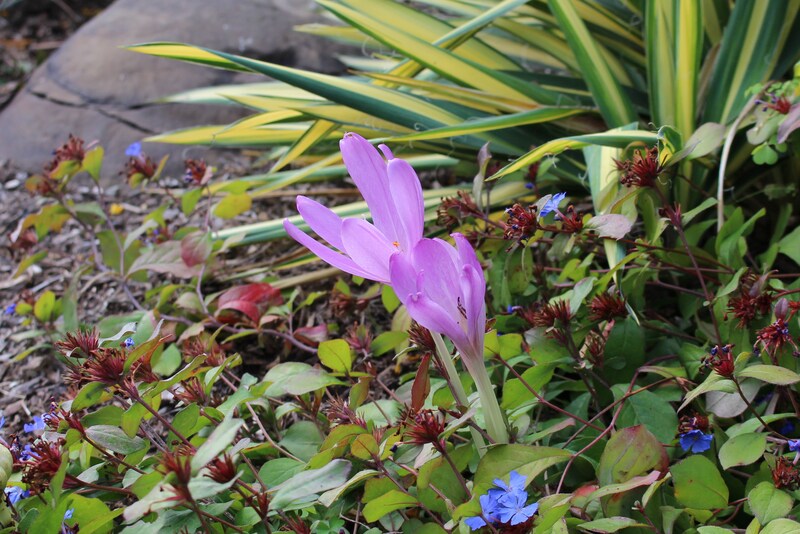 This entry was posted in colchicums, fall and tagged colchicum, fall, garden, wordless wednesday. Yep! it is here too, Cold enough for me to search for my slippers this morning! Tiles floors are wonderful in summer but Brrrr when the temperature drops. You had to admit it sooner or later, Frank! It’s turning pretty cool here now and the leaves are changing colour too. There’s a tropical storm coming our way as well. That always puts an end to the last flickers of summer. But what a lovely combination. Great planting. This was actually intentional. It’s one of the few times things fell together how I intended, and if it fills in more and does well next year I’ll be even more puffed up! True. And I am by far not a fall lover, so it pains me to admit I’m enjoying the autumn blooms. It almost hit 90 today, with sunshine and some big fluffy clouds, Even though things are happy and blooming, there are some leaves starting to FALL in Georgia! You’ll still have plenty of time to enjoy the cooling weather…. although 90 is still way too hot! Thanks for posting, I missed your second Nantucket post and just caught up. Beautiful photos! I love that combination of plants – it looks stunning! These might be three of my favorite plants right here. The yucca is so bright and the leadwort so reliable…. and I can never turn down a colchicum! I had a similar combination in my last (lamented) garden: Colchicum ‘Waterlily’ up through Geranium ‘Biokova’ which was flanked on both sides by the leadwort. 🙂 Waterlily is so top-heavy, though… probably needs a stiffer crinoline ‘skirt’ to keep its head up! Oh that’s a good match as well! The aging geranium foliage always develops that nice blush to it, I bet that looked great with the leadwort!